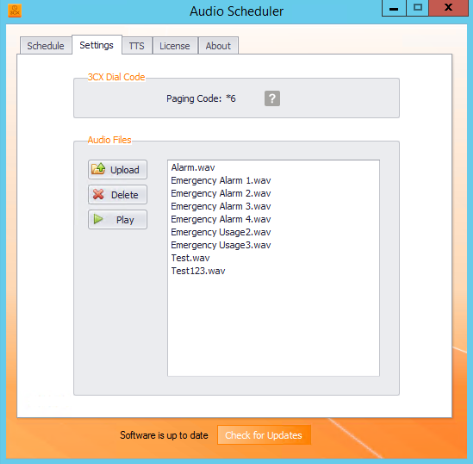 With 3CX Audio Scheduler you can schedule the playing of tones or alarms over your paging system (and phones). 3CX Audio Scheduler is great for notifying employees of break times, shift changes, and more. You can schedule multiple alarms throughout the day. You can play custom tones to meet your specific needs — including fire alarms, tornado warnings, or shift change notifications. 3CX Audio Scheduler is a perfect solution for Schools, Airports, Shift work. 1.1. 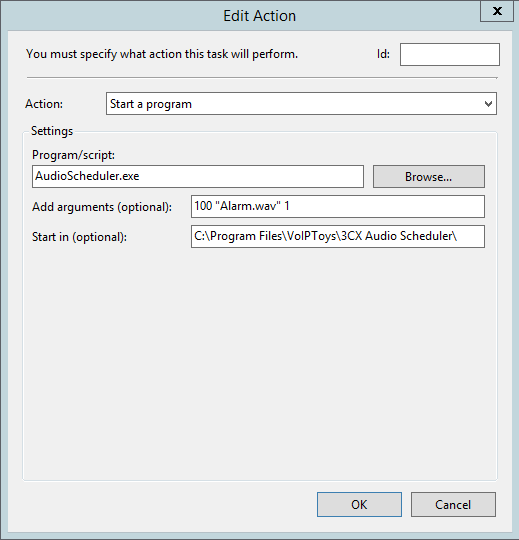 Why 3CX Audio Scheduler? • Schedule custom paging announcements or tones with 3CX Audio Scheduler. • Use it to notify staff of break times, shift changes and more. 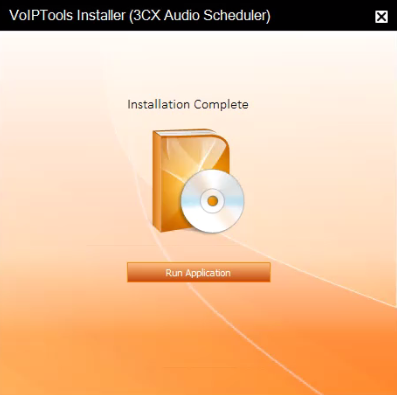 Before you begin with the installation steps mentioned in this guide, you need to ensure that your computer meets the minimum requirements mentioned below for installing 3CX Audio Scheduler. 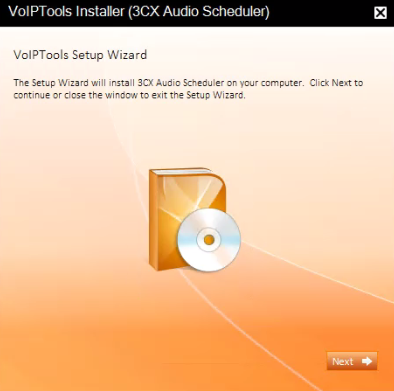 You can order 3CX Audio Scheduler on-line at http://www.voiptools.com. Your order confirmation email will include your license key and a link to download the software. 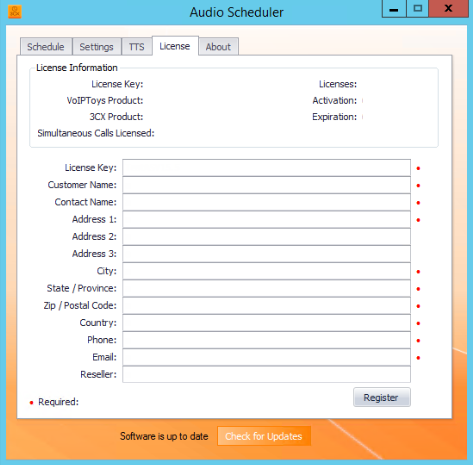 You must register your license key to activate 3CX Audio Scheduler. Your license key is included in your order confirmation email, and can also be found in your order history on our website. 2. 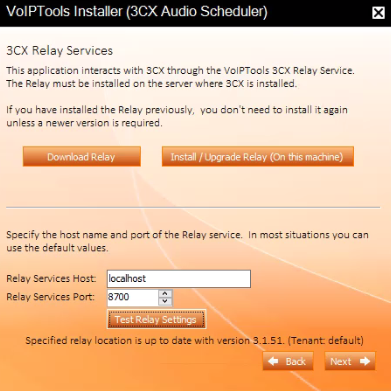 If you are installing 3CX Audio Scheduler directly on the 3CX server, you can install the Relay simply by clicking the Install/ Upgrade Relay button and following the Relay install instructions. 1. In the Relay Services Host field, enter “localhost” if installing 3CX Audio Scheduler on the 3CX server. If 3CX resides on a different server, enter the IP address or FQDN of the 3CX server. 3. Click Test Relay Settings to confirm 3CX Audio Scheduler can communicate with the Relay services running on the 3CX server. 1. On the 3CX Audio Scheduler configuration screen and in the License tab, enter your registration information in all the required fields (Note the red dot denotes a required field). The Settings screen enables you to set paging code that causes the phone to auto-answer, set path for ‘Audio Folder’ to store audio files, upload a new or delete an existing audio file from the 3CX Audio Scheduler. When dialing a phone, using the paging dial code will cause the phone to auto-answer (provided it is provisioned correctly). 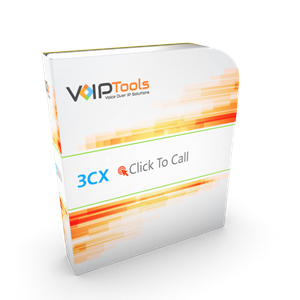 • Under 3CX Dial Code section, in the Paging Dial Code field enter valid dial code that is already configured in the 3CX Management console. 1. On the Audio Scheduler configuration screen and in the Settings tab, beside Audio Folder field, click Browse button. 2. 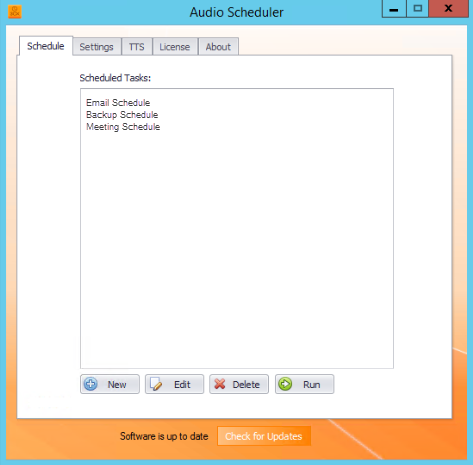 Select appropriate folder to store the audio files you uploaded into the 3CX Audio Scheduler. 1. In the Settings tab, click Upload button. 2. Browse for the audio file you want to upload. 1. In the Settings tab, under Audio Files section, from the ‘Audio File’ list box, select the audio file that you want to delete. Schedule tab enables you to create new scheduled tasks and delete, edit or run existing scheduled tasks. 1. In the Schedule tab and in the toolbar, click New button. 2. In the New Task dialog box, and in the Task Name field, enter the name for the scheduled task. 3. From the Dial Ext dropdown, select the extension for which you want to schedule the new scheduled task. 4. From the Audio File dropdown, select the audio file that you want to play for this new scheduled task. 5. If you want the phone to auto-answer the call, check Use Dial Code box. 7. In the New Trigger dialog box, enter appropriate details in all the fields of all the tabs. For more details, see New Trigger dialog box and for its definitions, see Trigger Type and Trigger Settings tables. 1. In the Schedule tab and from the Scheduled Tasks list box, select the scheduled task that you want to edit. 2. From the toolbar, click Edit button. Schedule Task Properties dialog box appears. General tab allows you to set general properties of a task. a. 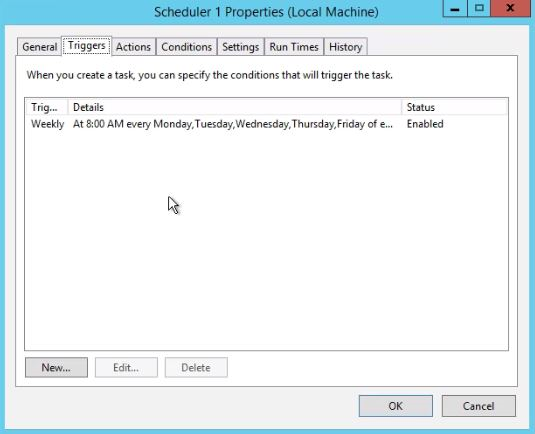 In the Schedule Task Properties dialog box and in the Description text field, enter the description for the task. b. Click Change User or Group… button to select a different user or group account for a task to run under. 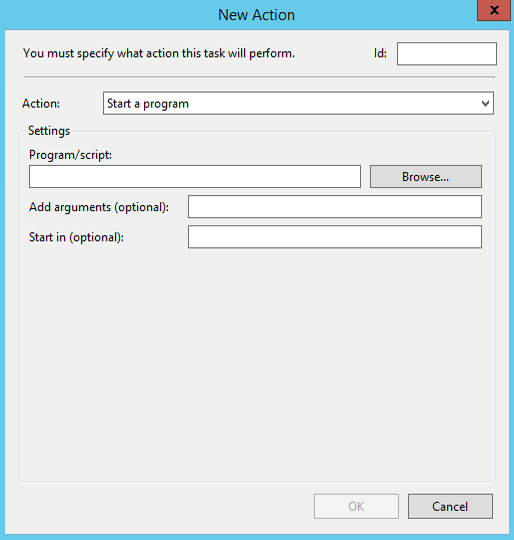 c. Select Run only when user is logged on option if you want to run the task interactively. 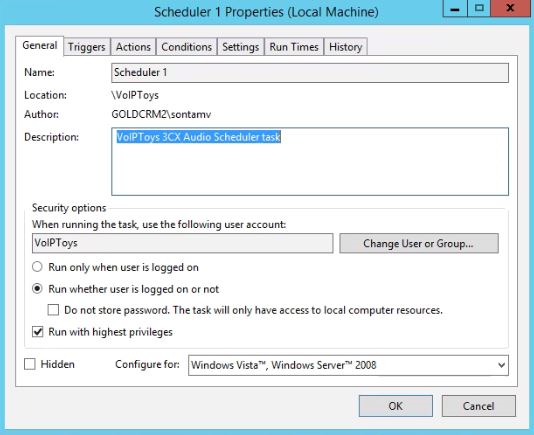 d. Select Run whether user is logged on or not option if you want to run the task when the user is logged in or not. When you select this option, you may be prompted to enter account credentials while saving the task, regardless of whether you checked Do not store password box or not. e. Check Do not store password box if you do not want the Task Scheduler to store the credentials on the local computer. f. Check Run with highest privileges to allow the scheduler to run the task that is registered using the Administrators group. g. From the Configure for dropdown select the operating system that the task is configured for. h. Check Hidden box if you want to hide the task. When you create a task, you can specify the conditions that will trigger the task. From the Triggers tab, you can view the list of existing triggers for the schedule task, add new trigger and, edit or delete existing trigger. You can access trigger settings from the New Trigger or Edit Trigger dialog box. a. In the Triggers tab, click New… button. New Trigger dialog box appears. b. In the New Trigger dialog box, from the Begin the task dialog box, select appropriate trigger. For more details, see Trigger Type table below. c. From the Settings section, select appropriate trigger setting and set the time at which you want the trigger to occur. For more details, see Trigger Settings table below. • Check Delay task for up to (random delay) box to specify an amount of time to delay the task from running, after the task is triggered. • Check Repeat task every box to set a repetition time interval for the task. The task will run, wait for the time interval specified, and then run again. This cycle will continue until the duration time is met. • Check Stop task if it runs longer than: box to stop long running tasks by setting a time limit on the amount of time the task is allowed to run (execute the action). • Check Expire box to set a date and time for the trigger to expire. • Check Enabled box to enable the task so that it can run. i. In the Triggers tab, click Edit… button. Edit Trigger dialog box appears. i. In the Triggers tab, from the trigger list box, select the trigger that you want to delete. A task action is the work that is performed when the task has run. A task can have single action or a maximum of 32 actions. Each action contains settings that determine how the action is performed. When you create a task, you must specify the action that will occur when your task starts. You can access ‘Actions’ settings when you create a new or edit an existing action. 1. In the Actions tab, click New… button. New Action dialog box appears. a. Start a program – This action starts a program on script. i. In the Program/ script text box, enter the name of the program or script that you want to start. ii. In the Add arguments (optional) text box, enter the arguments if the program or script takes command line arguments. iii. In the Start in (optional) text box, you can specify the working directory for the command line that executes the program or script. This should be either the path to the program or script file or the path to the files that are used by the executable file. b. 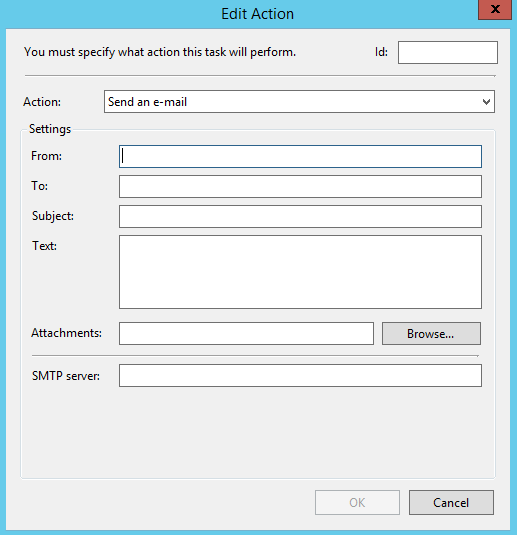 Send an e-mail – This action sends an e-mail when a task is triggered. i. In the From field, enter the e-mail address that acts as the sender of the mail. ii. In the To field, enter the e-mail address that the mail will be sent to. iii. In the Subject field, enter the subject of the e-mail. iv. In the Text field, enter the e-mail message. v.	As an optional, you can browse and add an attachment. vi. In the SMTP server field, specify the SMTP server that you use to send e-mail from. 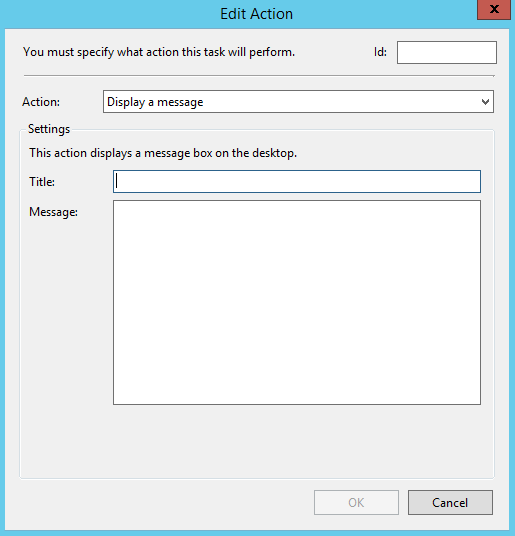 c. Display a message – This action shows a message box with a specified message and title. i. In the Title field, enter the title for the message. ii. In the Message field, enter the message that you want to send. 1. In the Actions tab, click Edit… button. Edit Action dialog box appears. 1. In the Actions tab, from the actions list box, select the action that you want to delete. Conditions control whether a task along with the trigger should run. The task will not run if any condition specified is not true. 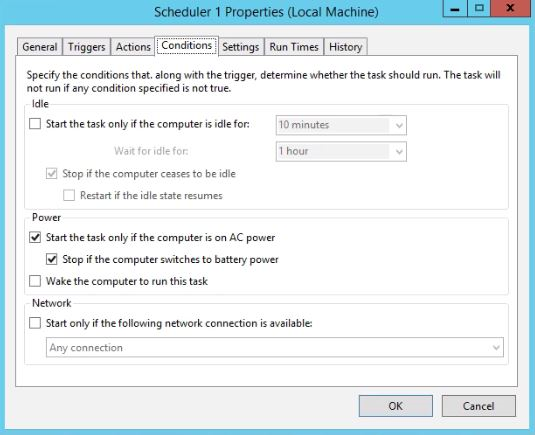 • Idle conditions are set to run the task only when the computer is in an idle state for a specific amount of time when a task trigger is activated. • Power conditions are set to run the task only when the computer runs on AC power (not battery power) when the task trigger is activated. If this condition is set, the task will stop if the computer switches to battery power. • Network conditions are set to run the task only if a specified named network connection is available or if any network connection is available when the task’s trigger is activated. If your task action requires a network connection to execute, then set this condition. a. Check Start the task only if the computer is idle for: box if you want the task scheduler to start the task if the computer is idle for the specified time. You can select the time from the dropdown. b. From the Wait for idle for dropdown, select the amount of time to wait (after the task is triggered) for the computer to enter an idle state. c. Check Stop if the computer ceases to be idle check box so that when a task is running while the computer is in idle state will stop running when the computer ceases to be idle. d. Check Restart if the idle state resumes box so that the task that stopped when the computer was in idle state will start running again the next time the computer enters an idle state. a. Check Start the task only if the computer is on AC power box if you want to run the task only when the computer runs on AC power. b. Check Stop if the computer switches to battery power box to stop the task if the computer switches to battery power. c. Check Wake the computer to run this task box to wake the computer from sleep mode and run the task when the trigger is activated. a. Check Start only if the following network connection is available box if your task action requires a network connection to execute. b. From the network connection dropdown, select required network connection so that the task will run when the specified network is available. 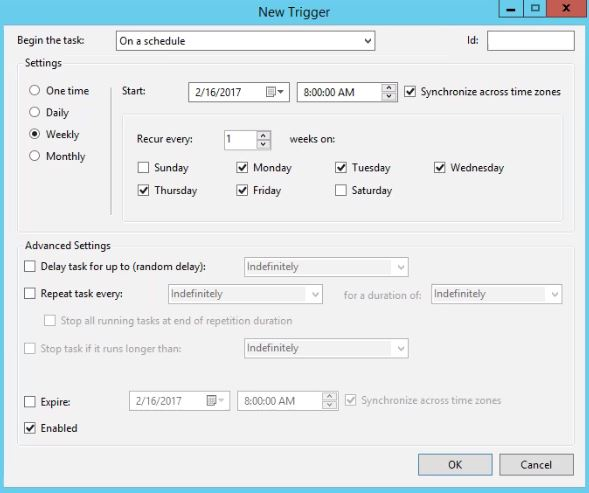 This trigger causes the task to run according to a schedule, and the trigger settings allow you to set the schedule. This trigger causes the task to run when a user logs on to the computer, and the trigger’s settings allow you to specify that the task should be triggered when any user logs on the computer or when a specific user logs on. This trigger causes the task to run when the computer starts up. The only settings for this trigger are the described in the Advanced Settings section of the New Trigger dialog box. This trigger causes the task to run after the computer enters an idle state, and the idle settings can be set from the Conditions tab in the Create Task or Task Properties dialog box. This trigger causes the task to run when specific event entries are added to an event log. This trigger causes a task to run as soon as it is created and when the task is modified. The only settings for this trigger are the advanced settings described in the Advanced Settings section of the New Trigger dialog box. This trigger causes a task to run when a user session is connected to from the local computer or from a remote desktop connection. This trigger causes a task to run when a user session is disconnected from the local computer or from a remote desktop connection. This trigger causes the task to run when the computer is locked. This trigger causes the task to run when the computer is unlocked. Choose date and time to trigger the task. Choose the recurrence interval for the task and the date and time to start the task. An interval of 1 produces a daily schedule and an interval of 2 produces an every other day schedule. The task will start at the specified time each day. Choose the recurrence interval for the task, the date and time to start the task, and the days of the week in which to start the task. An interval of 1 produces a weekly schedule and an interval of 2 produces an every other week schedule. The task will start at the specified time on each of the specified days. Choose the months in which you want to start the task and the weeks of the month and the days of the week for each month in which you want to start the task. You can also specify that you want to start a task on the last day of each month. Settings tab enables you to specify additional settings that affect the behavior of the task. The task settings specify how a task should run, stop or delete. a. Check Allow task to be run on demand box if you want to run the task at any time on demand. b. 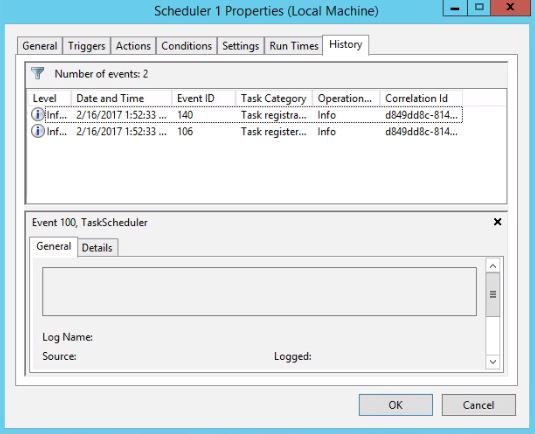 Check Run task as soon as possible after a scheduled start is missed box so that the Task Scheduler service will start the task if the task was scheduled to run at a certain time, but for some reason the task was not activated. 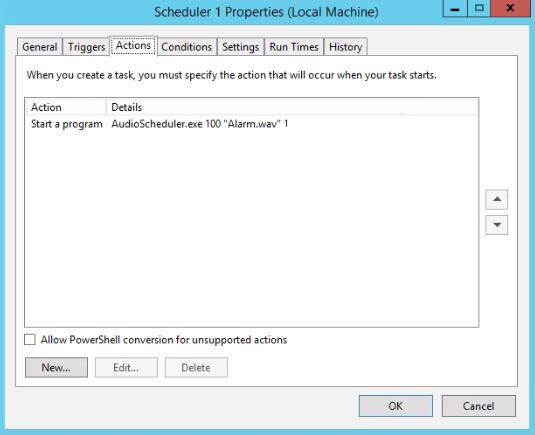 The Task Scheduler service will not start the task immediately after the task was missed. By default the service waits for ten minutes before starting the missed task. c. Check If the task fails, restart every: box to restart a task if the last run of the task fails. From the dropdown, specify the time interval that takes place between task restart attempts and the number of times to try to restart the task. d. Check Stop the task if it runs longer than: box to limit the amount of time a task is allowed to run and from the dropdown, select appropriate time. e. Check If the task is not scheduled to run again, delete it after: box so that the task Scheduler service will automatically delete the task after waiting for the specified time period, if it is not scheduled to run again. 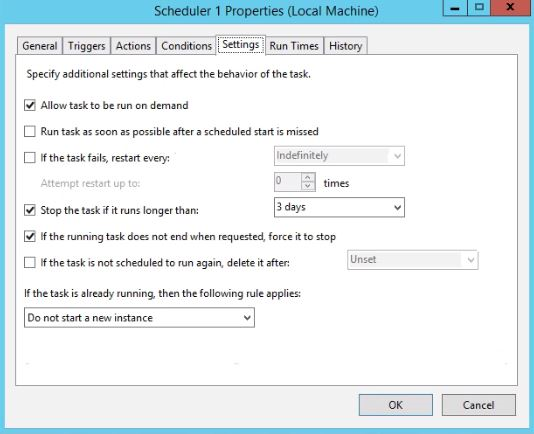 • Do not start a new instance – The Task Scheduler service will not run the new instance of the task and will not stop the instance that is already running. • Run a new instance in parallel – The Task Scheduler service will run the new instance of the task in parallel with the instance that is already running. • Queue a new instance – The Task Scheduler service will add the new instance of the task to the queue of tasks that the service will run, and the service will not stop the instance of the task that is already running. • Stop the existing instance – The Task Scheduler service will stop the instance of the task that is already running, and run the new instance of the task. Run Times tab allows you to view the scheduled tasks have not yet run and are ready to run once the time arrives. 1. 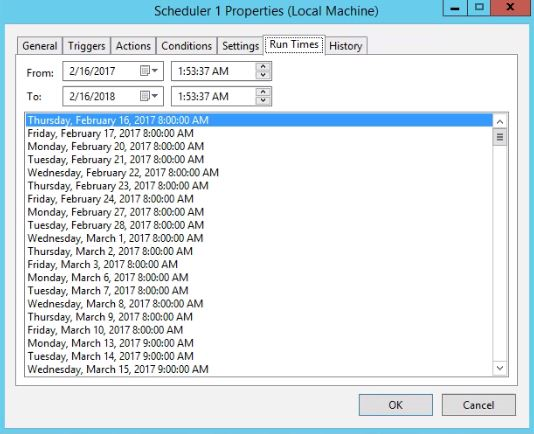 From the From calendar, select appropriate date and time from which you want to see the run times of the scheduled tasks that need to run. 2. From the To calendar, select appropriate date and time before which you want to see the run times of the scheduled tasks that need to run. History tab enables you to view the scheduled task logs that had run. The details include level, date and time, event id, task category, operation, and correlation id. To view further details, select the log and click General and Details tabs. 1. In the Schedule tab and from the Scheduled Tasks list box, select the scheduled task that you want to delete. 2. From the toolbar, click Delete button. 1. In the Schedule tab and from the Scheduled Tasks list box, select the scheduled task that you want to run. 2. From the toolbar, click Run button. The scheduled task causes to perform the call. 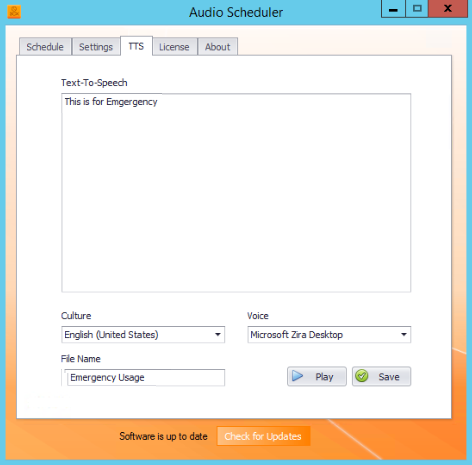 The TTS screen enables you to type the text that you want the ‘Audio Scheduler’ to convert into speech. The conversion will be done according to the Culture you select and the voice of the speech will be according to the Voice you select. 1. On the 3CX Audio Scheduler configuration screen, in the TTS tab, and in the Text-To-Speech textbox, type the text that you want the ‘Audio Scheduler’ to convert into speech. 2. From the Culture dropdown, select the type of language into which you want to the ‘Audio Scheduler’ to convert the Text-To-Speech. 3. From the Voice dropdown, select the voice so that the ‘Text-To-Speech’ audio file will play according to the voice you have selected. 4. In the File Name field, enter the name for the ‘Text-To-Speech’ audio file. 5. Click Save to save the ‘Text-To-Speech’ audio file. 6. Confirmation message box appears. Click OK.
7. Click Play to play the ‘Text-To-Speech’ audio file. Every time you play the ‘Text-To-Speech’ audio file, you should save it or else the file will be deleted from the database.